Music Prodigy is Practice and Assessment made simple. Music Prodigy is an easy way to manage music practice, assignments and assessments, saving you time, and helping students learn faster. 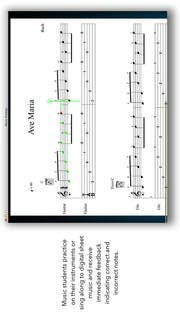 Made for music teachers and students, teachers manage and assign exercises and repertoire as homework. Teachers receive quantified reports of their students' performances and progress. When students practice their instruments or sing along to digital sheet music, they receive immediate feedback from Music Prodigy, helping them to quickly and efficiently improve. Music Prodigy turns correctly practiced notes green and incorrectly practiced notes red. Music Prodigy works with almost any instrument, including guitar, voice, violin and piano, with no additional hardware or external microphone is required. Music Prodigy makes any music interactive and mobile. Students can learn music faster because they receive real-time onscreen feedback, anytime, anywhere. Teachers can monitor students' progress remotely with Music Prodigy, and can improve in-person instruction because students are better prepared. Easy to use: Music Prodigy is easy to use. No teacher or student training is needed. Teachers can easily review student practice on their smartphone or laptop, leaving them with more time for rehearsals, sectionals, and individual student attention. Flexible: Students can sing or practice using any instrument. No adapters or external microphones required. Students can begin practice on their smartphone and finish on their laptop, never missing a beat. Practice whenever and wherever itâ€™s convenient. Personalized: Teachers choose the curriculum and repertoire they want and need. They control what musical content students see and access. They don't have to sift through pages of titles they don't want or need. Quantified: Music Prodigy evaluates every note using patented technology to bring quantified results for every performance. Teachers and students can easily measure progress, track engagement, spot trends, and focus on the right areas. Fun: Make student practice fun with game-like scoring, immediate feedback, and progress tracking. Educatifs / EntrainementThe Way of H, Inc.
Educatifs / Jeux, Ear TrainigThe Way of H, Inc.